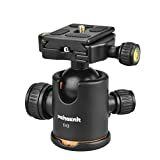 Features fluid 360 degree swivel, compatible with all cameras and camcorders. There are three operation knobs on the ballhead. Loosen horizontal control knob, the mounted cameral can be rotated 360°horizontally. Two knobs control the ball adjustable angle, achieve no dead angle. Platform with 1/4″ screw thread applied to most cameras. 8KG/17.63lb Loading Capacity, Height: 3.7″/98mm, Base Diameter: 55mm, Weight: 14.3oz/406g, a good kit for travellers. This entry was posted in Discount Photography and tagged Ball, Ballhead, Camera, Degree, DSLR, Duty, Fluid, Head, Pergear®Heavy, Photography, Plate, Quick, Release, Rotation, Tripod by Ball Photo. Bookmark the permalink.